I have a really big yard. Three springs ago when I started looking around and planning some changes I was really dismayed by all the sod that had been laid down in the front yard. I spent two weeks straight just pulling up that sod to plant a cutting garden. It was painful. So, skip ahead to present day. 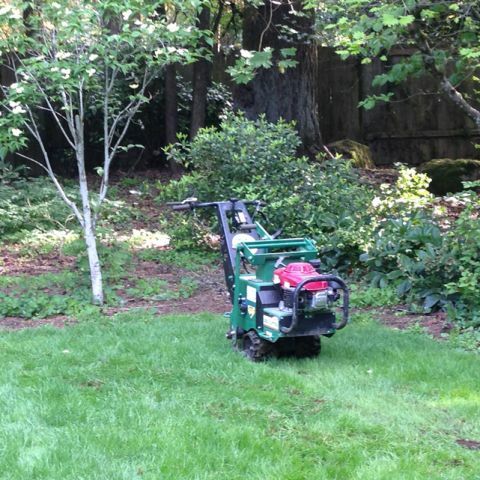 I have grass growing everywhere that I don’t want it and I discovered thing machine called a sod cutter. I decided to rent a sod cutter myself. The operation is simple: start like a lawn mower, lower the cutting mechanism to desired depth, put in gear and depress the handles to propel and engage the cutter. If you feel nervous or out of control you just let go! Now, my case was tricky as I was swerving in between plantings in one case and attempting to avoid the valve of my heating oil tank on the other patch slated for removal, but man, oh man did this machine do the trick! I did in 30 minutes what would have taken me two days constant attention. No sore muscles, no back pain, just neat slabs of sod to roll up and collect. Now if I only had more grass to pull up.